For an opinion piece that focussed on messaging, (DrinkWise a message about alcohol moderation most people support, Sydney Morning Herald, October 2, 2014) Drink Wise Chief Executive, John Scott certainly omitted some important information. So much so that perhaps his organisation’s latest campaign tagline, ‘You won’t miss a moment if you DrinkWise’ should be changed to read, ‘You’d be none the wiser if you DrinkWise’. Mr Scott says DrinkWise ‘sees the world as it is now’. What he doesn’t do is reveal the distorted, industry-centric lens that DrinkWise views this world. Allow me. DrinkWise is wholly funded by the alcohol industry and governed by a board with significant industry involvement. It is, in short, an organisation that exists solely to deflect consideration of evidence-based public health policies that may affect their bottom line. Like the Tobacco industry before it, urging Australians to ‘smoke responsibly’, DrinkWise urges Australians to ‘drink responsibly’. Note that ‘to drink’ is the default position, and, sadly, in reality, the only possible position the alcohol industry mouthpiece DrinkWise could ever be allowed to endorse. The real message from DrinkWise is that whatever else you do, please keep on drinking. Which is precisely why Mr Scott speaks about ‘a clear message of moderation’ without ever once defining what he believes moderation to be. Now unmasked, the ‘alliance of sports sponsors, media and the AFL with DrinkWise’ seems a little less pure and the DrinkWise campaign a little less saintly. Unfortunately the Kings of Australian sport have become the Ambassadors of Alcohol (let alone junk food and gambling) for Australia’s young people. DrinkWise is in fact an alcohol industry led coalition, and its latest campaign; a Carton & United Breweries branded beer advertisement produced by an award winning ad agency known for its beer commercials. It’s a blatant beer advertisement that only serves to strengthen the ties between sport and alcohol. DrinkWise claims falsely that such campaigns wouldn’t happen if not for the alcohol industry’s generosity. Yet in truth, the DrinkWise beer ad is designed with the express purpose of ensuring Government will not act. It’s a ‘Clayton’s’ public health campaign (ironically for an alcohol industry initiative), the public health campaign you have when you’re not having a public health campaign. Mr Scott also claims that the DrinkWise campaign wouldn’t see the light of day without alcohol companies making available advertising or promotional space at significant events. It is very hard to see how Carlton & United Breweries are being in any way charitable or generous by promoting an advertisement that features a glass of beer in every frame and a Carlton & United Breweries logo at the end of the ad. Like the tobacco industry before it, the alcohol industry continues to insert itself into public health policy so as to provide an excuse for Government inaction. 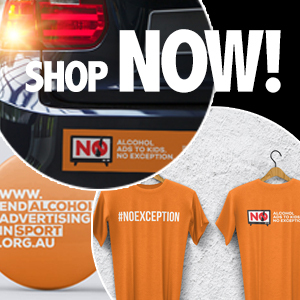 The alcohol industry claims its sponsorship is vital for some Australian sports. Sponsorship is simply a marketing cost paid for by the consumer, and we can have other ways of funding, using a surcharge on the industry (as they have very successfully done in Thailand and as we have done to replace harmful tobacco advertising. It is important that we recognise DrinkWise as the alcohol industry vehicle it really is, and to understand the lens through which they view the world. Such critical thinking would serve us all well when we’re watching the next DrinkWise beer ad.